The event was held on Saturday during PM Modi's visit. 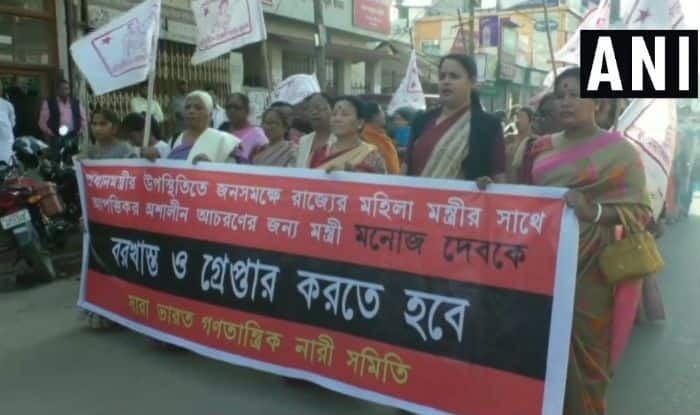 Agartala: The women’s wing of Communist Party of India-Marxist (CPI-M), AIDWA, organised a protest in Agartala against state Minister Manoj Kanti Deb for allegedly inappropriately touching state Minister Santana Chakma during a BJP rally in the city on February 9. Deb was seen publicly touching Chakma, the Social Welfare and Social Education Minister, around the waist while he was on stage with Prime Minister Narendra Modi at a function. The video clip then went viral. Chief Minister Biplab Deb was also present at the event. Opposition Left Front has demanded that Deb be sacked and charged with sexual harassment. “Deb must be sacked and be arrested for touching the woman minister in an extremely indecent manner on the stage from where Prime Minister Narendra Modi, Chief Minister Biplab Kumar Deb and others addressed the public gathering,” Left Front convener Bijan Dhar was quoted as saying to mediapersons. Dhar said many young and middle-aged women had been raped or murdered since the BJP-led government came to power in Tripura 11 months ago but this incident on a public platform was “extremely reprehensible and needs punishment”. Meanwhile, the BJP claimed that the Opposition was indulging in “character assassination”. BJP spokesman Nabendu Bhattacharjee said the Left Front, after raking up non-issues against the BJP government, has “started character assassination of BJP ministers on false and non-issue matters”. When contacted by IANS, Deb, who holds the Food, Youth Affairs and Sports portfolios, said over the phone that he had no comments on this issue.